TopView can perform alarm and notification function for many popular SCADA/HMI packages. The communication between TopView and the SCADA/HMI is usually through the OPC Server provided by the SCADA/HMI. Out of the box, TopView OPC allows you to connect to any OPC-compliant Server. This could be an OPC Server for a PLC, control system, historian, or SCADA/HMI. TopView OPC give the user full control over its configuration – the points to monitor, handshaking for acknowledge, health monitoring, notifications, reports, and more. The SCADA/HMI Connectivity Packages for TopView are designed to simplify the integration of TopView with many popular SCADA/HMI packages. Initial TopView configuration can be completed by a single click that imports the alarm details from the SCADA/HMI. After the initial configuration it can can continue to help synchronize the alarms in the SCADA/HMI and TopView. SCADA/HMI integration components are included to provide bi-directional watchdogs and access to various features and components in TopView. And if you’re moving from Win-911 or SCADAlarm to TopView, the Application Import can convert your Win-911® or SCADAlarm configuration to TopView. Versions earlier than 2012 (10.5) – The InTouchBase.cfg TopView configuration will work with earlier versions, and the InTouch tags can be imported, but InTouch displays and scripts must be manually created. Versions earlier than 2012 – The SystemPlatformBase.cfg TopView configuration will work with earlier versions, but System Platform objects must be manually created. Full support for versions 6.x, 7.x, 8.x, 9.x. Files are designed for v9.0. Use the Gfx files and images inside the V6.X folder for versions prior to 9.0. All other files can be imported to versions prior to v9.0. Versions earlier than 6.x – The FTViewSEBase.cfg TopView configuration will work with earlier versions, and the tags can be imported as well. However, any displays must be manually created for versions earlier than v6.0. Simple Tag Converters for all three types of alarming – FactoryTalk Tag-Based A&E, FactoryTalk Controller-Based A&E, FactoryTalk HMI Tag Alarms. 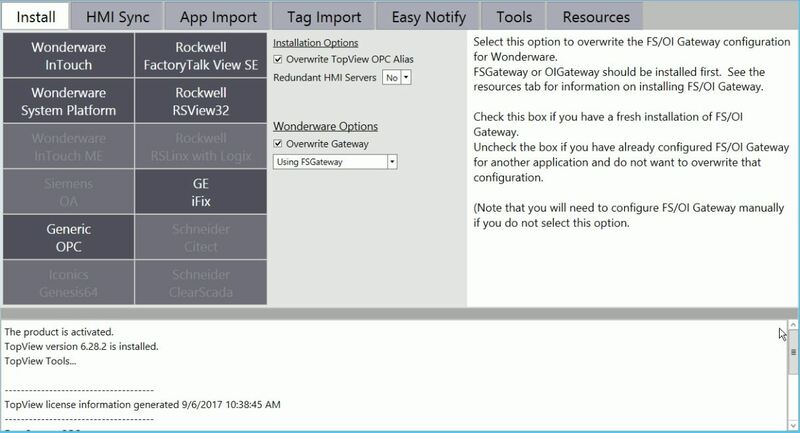 A configuration of the Gateway required to connect TopView OPC to the manufacturer’s protocol – see above for supported SCADA Systems. 1 sample HMI alarm tag for reference. Tag listing for each HMI is shown below. A set of HMI tags and scripts (or object packages) that are imported into the HMI for status and alarms. Contacts Easy Entry Tool – Microsoft Excel utility for quick entry of contacts. Mobile phone numbers are converted to an email address based on carrier. Users can optionally import the contacts (.csv) into TopView for adjustments. Escalation Templates Easy Entry Tool – Microsoft Excel utility for quick entry of notification order. All existing contacts, groups, and notification messages are read when opening the file so that they are selected rather than typed. Options are available to enter the “delay between” notifications rather than the actual delay after the alarm occurs. Users can optionally import current escalations (.csv) into TopView for adjustments. Simple Tag Converter – for each HMI type that will convert the alarms in the HMI database export into a TopView. Application Import – What’s Included? Pre-configured TopView configuration that includes every alarm tag and every analog tag (some HMIs only) that exists in the customer’s current HMI application. The result is a fully functional TopView configuration ready to communicate with the customer’s HMI to monitor all alarm tags and values. Win-911® Pro/SCADAlarm Conversion – What’s Included? A pre-configured TopView configuration that includes every discrete alarm tag and every analog alarm tag that exists in the customer’s current Win-911/SCADAlarm application. Also includes the Contacts (with details), Groups, and Schedules that exist inside their current Win-911/SCADAlarm application. The customer completes an “Entry” spreadsheet containing several options for the import. Each option is detailed with a instructions that are displayed by hovering the mouse over the cell inside the spreadsheet. The customer sends the completed “Entry” spreadsheet alongside a zipped version of their Win-911/SCADAlarm application. Conversion executed and customer receives a set of files and a utility that copies those files to the correct location. Assistance can be provided if remote access is available. The result is a fully functional TopView application ready to communicate with the customer’s HMI and monitor all alarm tags and values. Optionally, the customer can also send a zipped version of their HMI application for conversion. Once the conversion has been executed, the customer will receive a spreadsheet that compares the differences in their current HMI application vs their Win-911/SCADAlarm configuration. This process provides a way to error-check any tags that may have been added to the HMI since installation, but were forgotten inside Win-911/SCADAlarm either during initial commissioning or modifications since the original installation. It also identifies any mistakes or typos in the current Win-911/SCADAlarm configuration.